Marine HVAC supplier Heinen & Hopman has introduced a new service that can accurately predict where deficiencies in the HVAC system may occur before mounting a single piece of equipment onboard a ship. Using computational fluid dynamics (CFD) technology, the HVAC system design is analyzed to validate whether the HVAC installation shall meet specific requirements. CFD is a well-established technology in many industries. 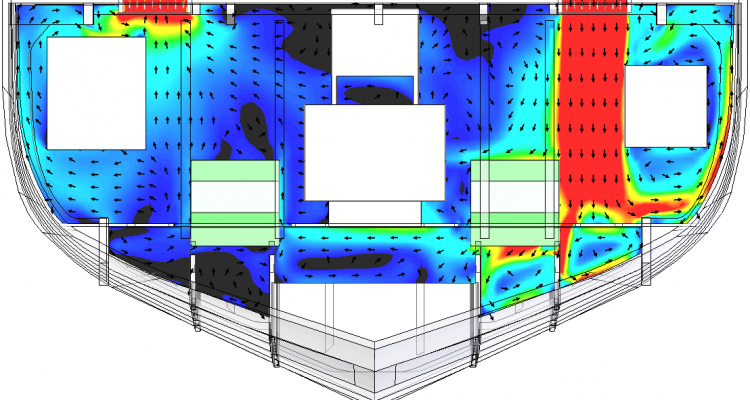 With CFD technology, air flows can be realistically simulated to identify common HVAC problems such as drafts, high levels of turbulence, high pressure drop and poor air distribution. CFD considers everything from the influence of sunlight to the layout of the rooms and the placement of air vents around furnishings, resulting in a comfort analysis and/or product validation. The goal is to figure out the best air circulation solutions for a specific space. Heinen & Hopman offers four types of analyses: a flow analysis, a comfort analysis, a pressure analysis of the total system and a thermal analysis of the total system. CFD is also a very useful tool for troubleshooting the HVAC system and optimizing system performance after installation, resulting in increased comfort and effectiveness. With this simulation you can visualise gas or liquid flow patterns and velocity. Local Air Changes Index (LACI), Local Mean Age (LMA), Contaminant Removal Effectiveness (CRE) & Local Air Quality Index (LAQI).